4 in the learning process instead of the teacher just filling them with information. I want my students to know that I care about each one of them, and I can do this through creating a partnership with them. 4. I believe that students should be given the opportunity to make their own decisions. This belief matches Barbara Coloroso s theory of Inner Self-Control. Coloroso believes that discipline works best when students have developed an inner sense of self-control. She states that classrooms are an ideal place for students to learn how to make responsible decisions. In order for this theory to be successful, the teacher and students must work together which goes along with my earlier beliefs. 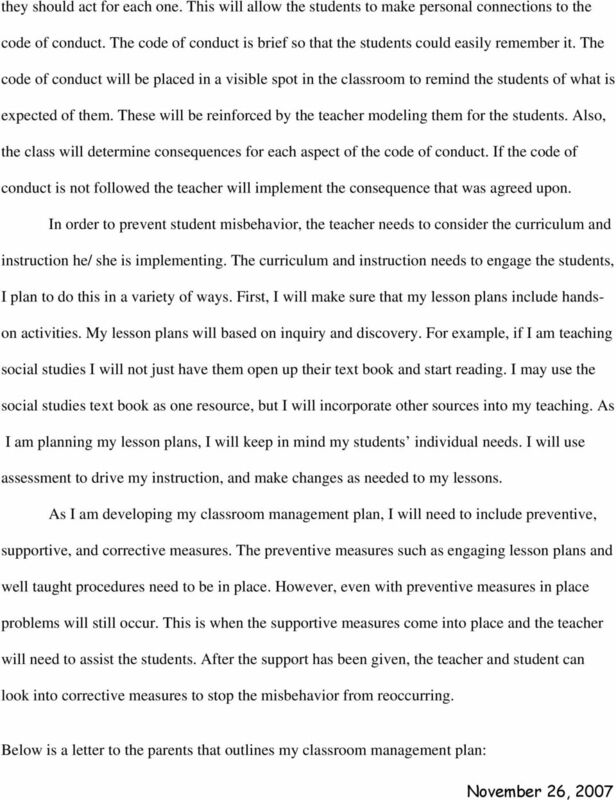 I agree that the teacher should provide the students with the appropriate tools and support to solve their problems. The skill of knowing how to make responsible decisions will not only be beneficial to the students while they are in school, but for the rest of their lives. 5. I believe in using I-messages to communicate my feelings to the students. This practice is introduced by Thomas Gordon in his theory of Discipline through Inner Self-Control. 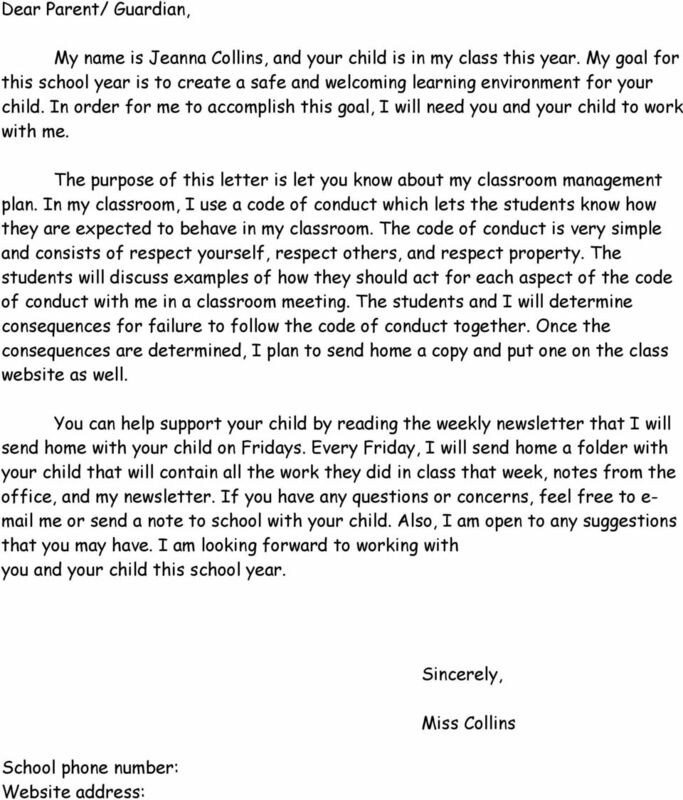 I-messages allow the teacher to share their personal opinion with the students in a non-threatening way. 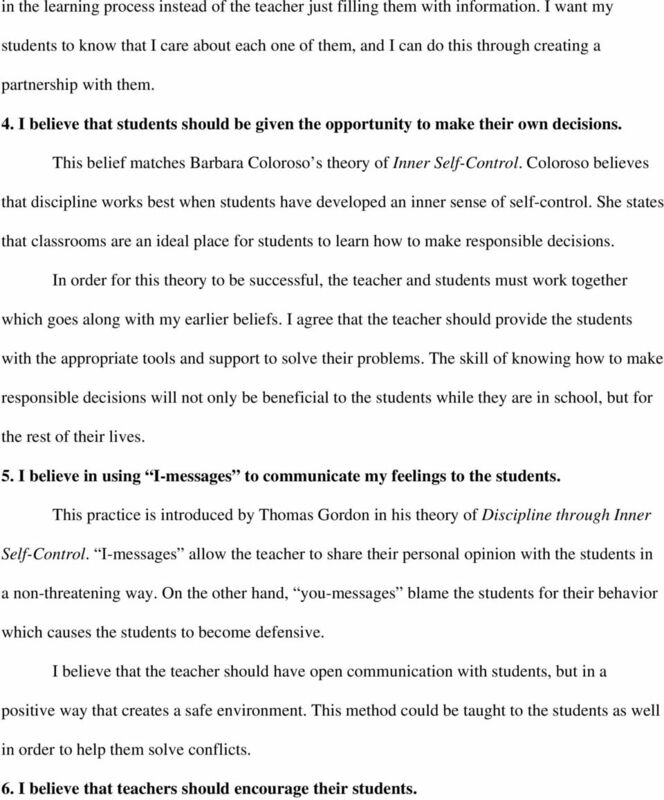 On the other hand, you-messages blame the students for their behavior which causes the students to become defensive. I believe that the teacher should have open communication with students, but in a positive way that creates a safe environment. This method could be taught to the students as well in order to help them solve conflicts. 6. I believe that teachers should encourage their students. 5 William Glasser refers to teachers who provide encouragement to their students as lead teachers. Glasser states that teachers should not try to force information into their students. This makes common sense to me because who likes to be forced to do something. 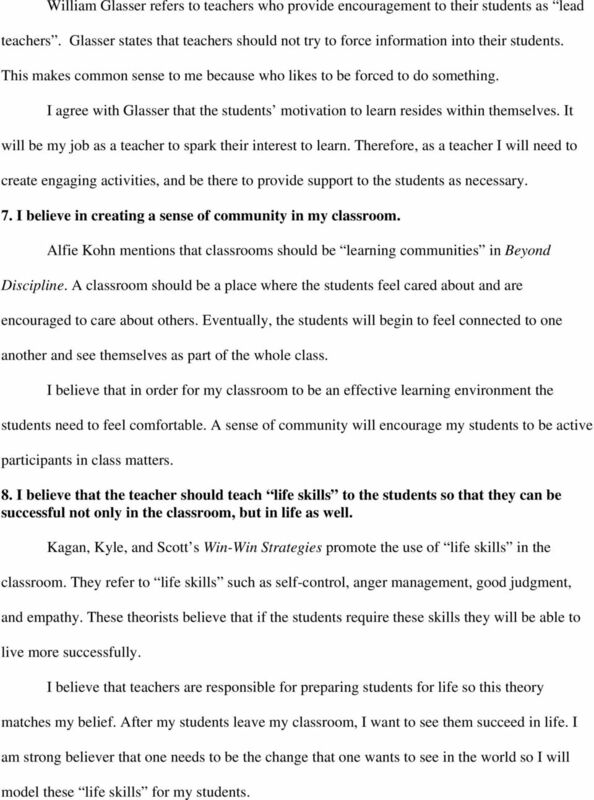 I agree with Glasser that the students motivation to learn resides within themselves. It will be my job as a teacher to spark their interest to learn. Therefore, as a teacher I will need to create engaging activities, and be there to provide support to the students as necessary. 7. I believe in creating a sense of community in my classroom. Alfie Kohn mentions that classrooms should be learning communities in Beyond Discipline. A classroom should be a place where the students feel cared about and are encouraged to care about others. Eventually, the students will begin to feel connected to one another and see themselves as part of the whole class. I believe that in order for my classroom to be an effective learning environment the students need to feel comfortable. A sense of community will encourage my students to be active participants in class matters. 8. I believe that the teacher should teach life skills to the students so that they can be successful not only in the classroom, but in life as well. Kagan, Kyle, and Scott s Win-Win Strategies promote the use of life skills in the classroom. They refer to life skills such as self-control, anger management, good judgment, and empathy. These theorists believe that if the students require these skills they will be able to live more successfully. I believe that teachers are responsible for preparing students for life so this theory matches my belief. After my students leave my classroom, I want to see them succeed in life. I am strong believer that one needs to be the change that one wants to see in the world so I will model these life skills for my students. 7 touched upon again. For example, I discuss procedures in belief number ten. 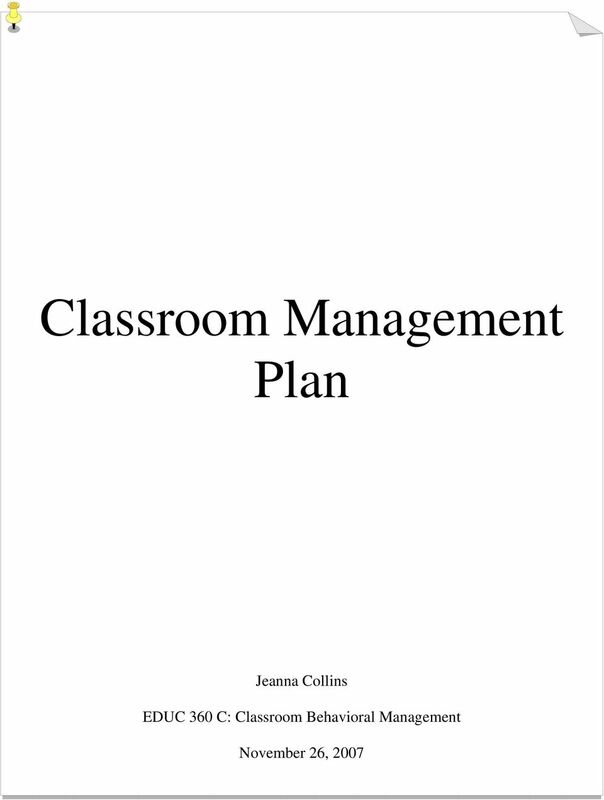 In the next section, I will describe six procedures that are essential to classroom management. 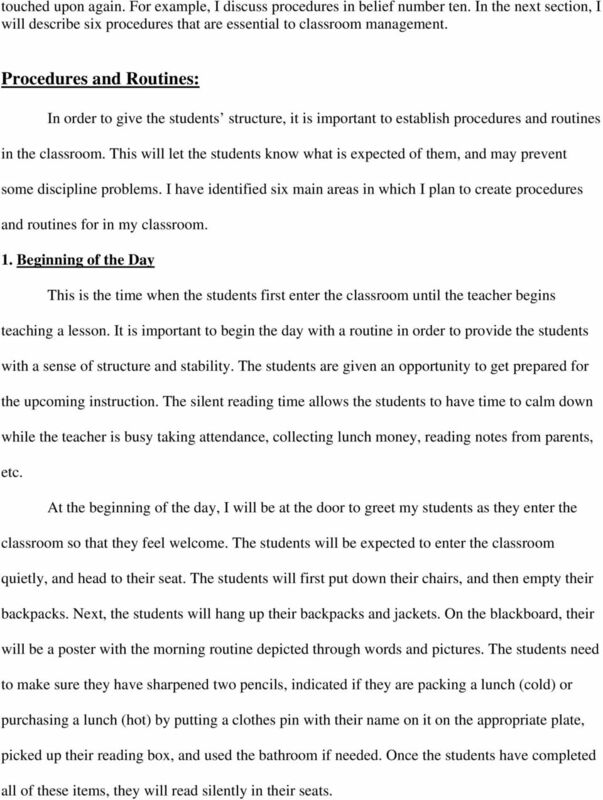 Procedures and Routines: In order to give the students structure, it is important to establish procedures and routines in the classroom. This will let the students know what is expected of them, and may prevent some discipline problems. I have identified six main areas in which I plan to create procedures and routines for in my classroom. 1. Beginning of the Day This is the time when the students first enter the classroom until the teacher begins teaching a lesson. It is important to begin the day with a routine in order to provide the students with a sense of structure and stability. The students are given an opportunity to get prepared for the upcoming instruction. The silent reading time allows the students to have time to calm down while the teacher is busy taking attendance, collecting lunch money, reading notes from parents, etc. At the beginning of the day, I will be at the door to greet my students as they enter the classroom so that they feel welcome. The students will be expected to enter the classroom quietly, and head to their seat. The students will first put down their chairs, and then empty their backpacks. Next, the students will hang up their backpacks and jackets. On the blackboard, their will be a poster with the morning routine depicted through words and pictures. The students need to make sure they have sharpened two pencils, indicated if they are packing a lunch (cold) or purchasing a lunch (hot) by putting a clothes pin with their name on it on the appropriate plate, picked up their reading box, and used the bathroom if needed. Once the students have completed all of these items, they will read silently in their seats. 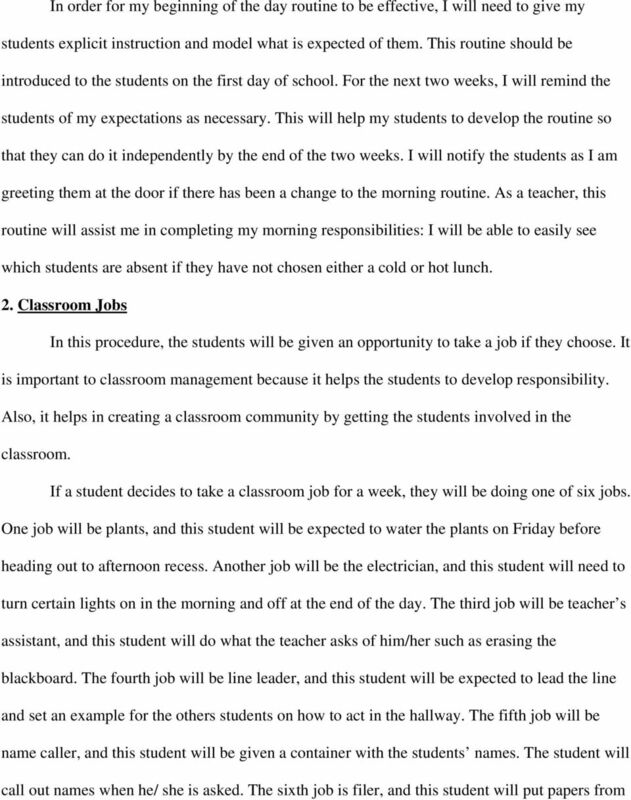 10 This is time when the students and teacher can come together to have class discussions about a variety of topics. The community circle is important to classroom management because the students are given a chance to contribute their opinions. It lets the students know that their opinions are valued, and helps to create a sense of community. During a community circle, the students will be expected to be respectful to one another. The students should not talk when another student is speaking or use put downs. In the community circle, the rules of the classroom still apply. Therefore, if a student is not showing another student respect, the consequences will be put into place that have already been determined by the teacher and the students. 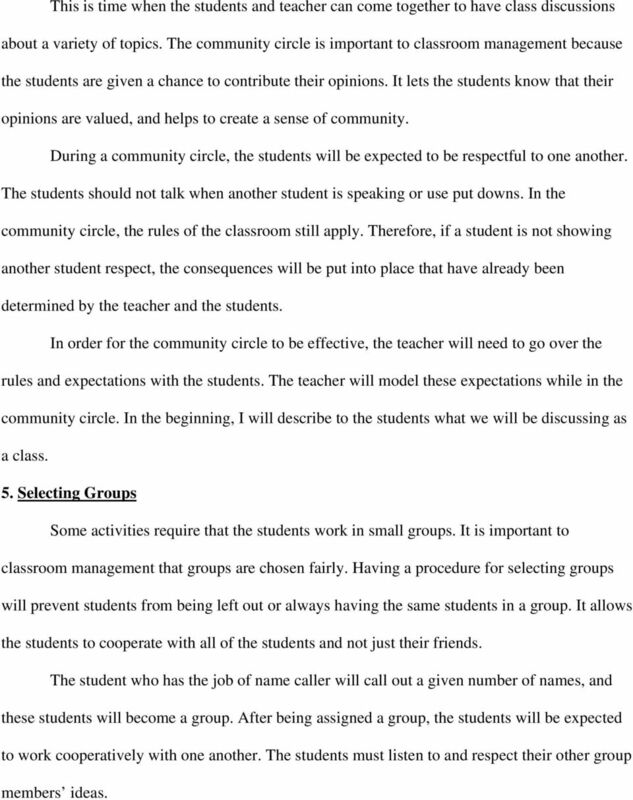 In order for the community circle to be effective, the teacher will need to go over the rules and expectations with the students. 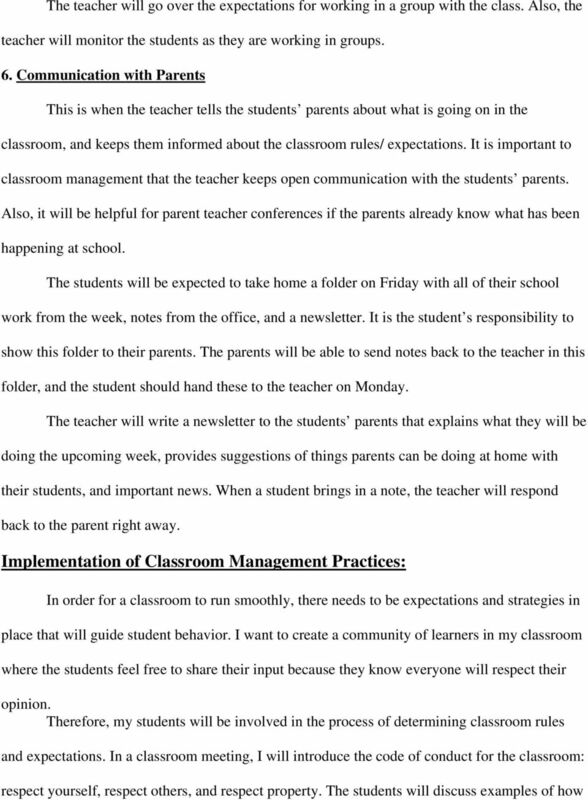 The teacher will model these expectations while in the community circle. In the beginning, I will describe to the students what we will be discussing as a class. 5. Selecting Groups Some activities require that the students work in small groups. It is important to classroom management that groups are chosen fairly. Having a procedure for selecting groups will prevent students from being left out or always having the same students in a group. It allows the students to cooperate with all of the students and not just their friends. The student who has the job of name caller will call out a given number of names, and these students will become a group. 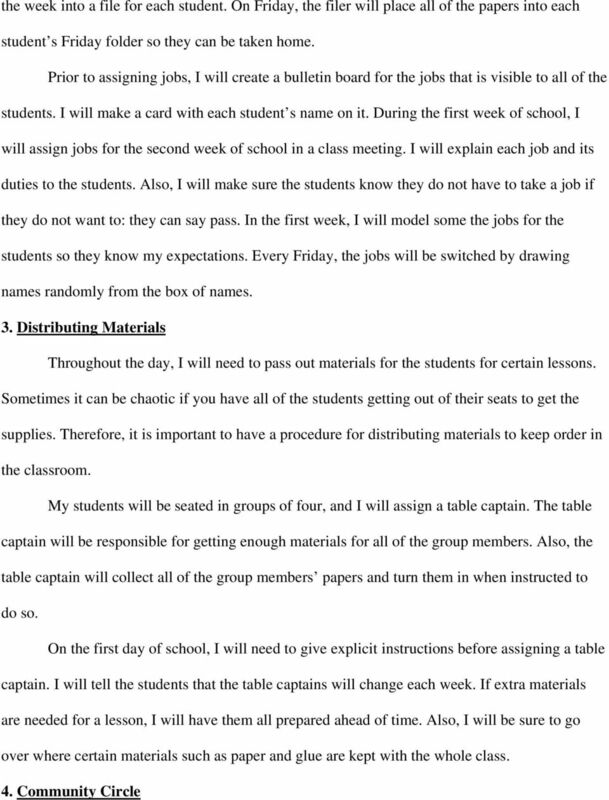 After being assigned a group, the students will be expected to work cooperatively with one another. 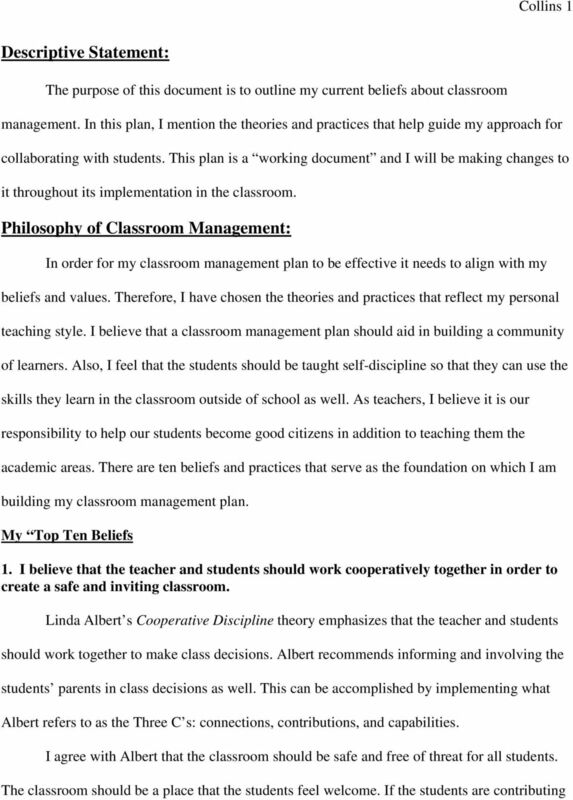 The students must listen to and respect their other group members ideas. You are the teacher. You are the leader in your classroom. Spirals of Inquiry. Scanning takes a wide perspective on learning - not just a focus on aspects of academic learning that are easily measured. Welcome to our classroom. First grade is a big step, and we hope that after tonight you will understand more about your child s day at school. 1201 CHILD PLACEMENT SERVICES CHANGE # 10-2008 October 2008 XI. SHARED PARENTING The implementation of shared parenting meetings in child placement cases is one of the Multiple Response System Strategies.